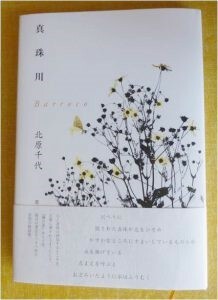 Good news for fans of modern Japanese poetry: Chiyo Kitahara has published “A River of Pearls – Barroco”, her 4th book. It’s theme: the impact of our life and our memories on our body and soul. The book has won the 67. Mr. H. award. “A River of Pearls – Barroco” is a beautiful, handmade book. It was designed by the renowned artist Koji Ise, who worked for the literary essayist Atsuko Suga (1929–1998). 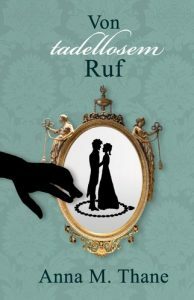 The photografic artwork featured on the book cover was inspired by silhouette cutting and Japanese sumi-e. You can find many of the photos in Regency Explorer’s Museum of Creativity, at the exhibition “Spring Butterflies – A Photography Project”. I am very proud to present poetry from “A River of pearls – Barroco”. I have translated the beautiful poem “koushin” (“correspondence”) into English for you. It surely must be a letter? Chiyo Kitahara kindly was available for an interview about her latest work. Anna: The title of your book is composed of Japanese and Portuguese words. Why? Chiyo Kitahara: Oh, it’s a pointed question! Well, in the beginning, I was thinking about a title in Japanese only – ‘a river of pearls’. But I soon released that the title was incomplete: Though on the one hand the poems are about a river and water running through a village or one’s inner body, they are, on the other hand, also about the human soul and spirit deep inside us. We can’t see the soul with our eyes, but if we could, I think we would find each soul to be distorted – like the irregular pearl, called baroque pearl. ‘Baroque pearl’ originally means ‘distorted pearl’. When adding this aspect to the title, I chose the Portuguese word, not the English one. ‘Barroco’ sounds beautiful, and it also perfectly visualises pearls scattered along a river. Is there an overall theme to your new book? Chiyo Kitahara: My writing is not based on realism. All poems, including the title ‘A river of pearls’, are based on images. I have worked with images of a river and of water. They symbolise life. So the poems are about life, ‘the life’ of us all. Memories of childhood, adolescence and blossom, pregnancy, parenting, and aging are carved into our body and our heart. However, I didn’t write poems about my personal memories. The impact of our memories on our body and heart is a universal experience of mankind. The poems are, however, to some degree inspired by the surroundings of my family, neighbours, and close friends. They are also inspired by the place where I live, a small village with a forest and a small river. If it weren’t for them, I could not have created the poems of ‘A River of Pearls – Barroco’. Can you tell us about your writing experience while working on “A River of Pearls – Barroco”? Chiyo Kitahara: Originally, I wanted the book to be published in 2015. But at that time, the river was feeble; it could not flow by itself. After writing some pieces that you find mostly at the ends of the book, the river suddenly began to swell and flow, though the village, and in my body. I understood it was time to start again. This summer, the book was born at last, with a very sensitive, beautiful cover design, thanks to both photographer and designer. Chiyo Kitahara: My first essay dedicated to Atsuko Suga. Publishing is scheduled for 2018 . I also make arrangement for a reading performance in Tokyo, and several lectures in Kyoto and Nishinomiya, near Kobe. Then, my periodical “bara-iro-tsume” is due in a couple of month. The book won the annual Mr. H. award in 2017. You can buy “A River of Pearls – Barroco” here.